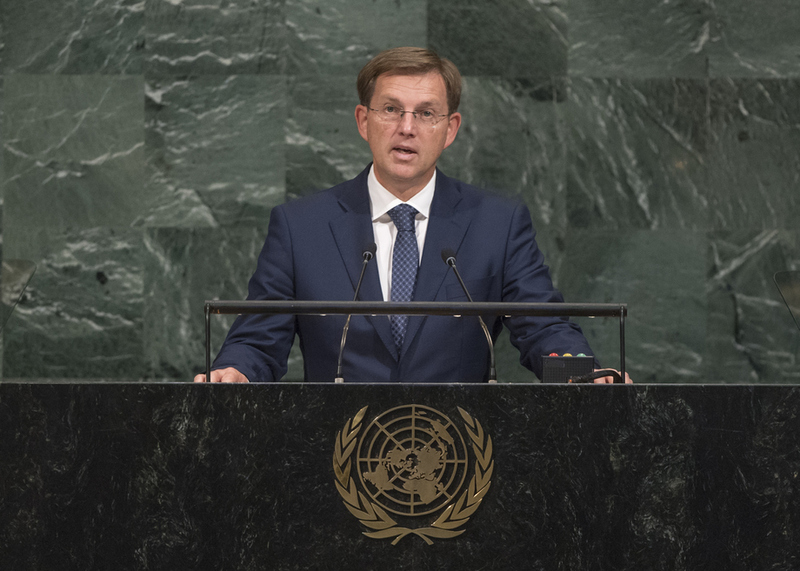 MIROSLAV CERAR, Prime Minister of Slovenia, commended the Secretary-General’s actions to bolster multilateralism and the reform agenda, recalling the importance of the Sustainable Development Goals and the Paris Agreement. Citing gains, he said Slovenia ranked high on the Sustainable Development Goals Index and in the Dashboards Report 2017, and was among the top 10 of 157 measured countries in achieving the Goals. Slovenia’s commitment to the environment had also been demonstrated by its proposal to designate 20 May as World Bee Day. More broadly, he advocated shared responsibility and solidary in addressing global migration and refugee flows, noting that Slovenia had held consultations on the global compact for safe, orderly and regular migration and the global compact on refugees. Reiterating that States bore the primary responsibility for fulfilling human rights, he said that, as a member of the Human Rights Council, Slovenia would continue to advocate a progressive approach and the protection of norms and standards. Attention must be given to children’s rights, gender equality, women’s empowerment and the rights of older persons. More must also be done to mitigate harm to civilians, and he underlined the need for a zero-tolerance policy on all forms of sexual exploitation and abuse. Slovenia placed the rule of law and international law at the centre of its foreign policy, he said, with a goal of ending impunity for the most serious international crimes and promoting international criminal justice, including through the International Criminal Court. He expressed strong support for the relationship between the United Nations and the Court regarding jurisdiction over the crime of aggression anticipated by end of 2017, and swift activation of the Kampala amendments on the crime of aggression. He expressed concern over situations in Syria, Afghanistan, Yemen, Iraq, Libya, Mali, South Sudan and the Democratic Republic of Congo, and he called upon all relevant parties to refrain from the use of force and invest in political dialogue. Welcoming the reform of the United Nations counter-terrorism architecture, he said Slovenia was committed to treaty-based nuclear disarmament and arms control with full implementation of the Treaty on the Non-Proliferation of Nuclear Weapons. He strongly condemned the Democratic People’s Republic of Korea’s violations of Council resolutions and international commitments. “Conflicts cannot be prevented or resolved by addressing consequences alone,” he said. “We must address the underlying causes.” To sustain peace, he advocated thinking long-term and opting for diplomacy, mediation and conflict prevention. Slovenia would support reforms that improved the United Nations’ coordination, avoided duplication and achieved results.